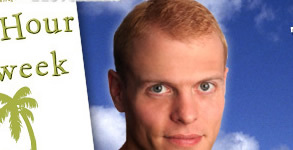 I just couldn’t leave off for today without giving some love to my new current hero, Tim Ferriss. In case you don’t know who he is, Tim wrote one of this year’s bestsellers, The 4-Hour Workweek. I won’t get into the book too much right now (I’m saving that for a time when my eyes aren’t burning from sitting in front of these screens for 15+ hours) because the book isn’t really why I like this guy so much. The book got me excited about Lifestyle Design, but it was Tim that put that fire back in my belly– giving me a purpose, a lifestyle to strive for. Basically, he does what he wants. I highly encourage you to check out his blog. It’s a funky mix of small business musings, social activism, vagabonding goodness, with random bits of foreign culture and videos (example: how to tie the perfect tie).